The puppy adoption application time frame is now closed. As of February 6, 2019, GPA-WI is not accepting any further applications for puppies. Please note that GPA-WI does not perform on-site, on-the-fly adoptions. GPA-WI cannot guarantee that any specific greyhounds listed on the adoptable greyhounds page online will be available once you go through the GPA-WI adoption process. To learn about GPA-WI’s adoption process and screening for new adopters, visit the GPA-WI adoption process webpage: click here. GPA-WI rarely performs out-of-state adoptions. GPA-WI’s adoption process relies on a home visit in addition to a written application, and GPA-WI prefers to place our greyhounds locally so that we can act as a resource for any follow-up issues or concerns the adoptive family might have. Your adoption success can be best achieved working with an adoption group closer to your area. 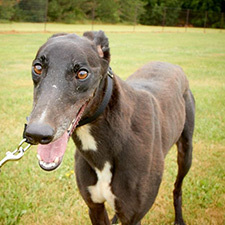 This provides you with an adoption support system that’s close by for both you and the greyhound. You can find a greyhound adoption group in your area by visiting the Greyhound Project’s online Greyhound Adoption Agency Directory.